St. Petersburg has only one airport Pulkovo (IATA code LED, ICAO code ULLI) that’s located just 19 km from the city center (Nevsky prospect) and 9 km from the nearest metro station Moskovskaya. Currently it runs one terminal serving both international and domestic routes. Address: Pulkovskoe shosse (road), 41, lit. ZA. About how to get to / from Pukovo read here. 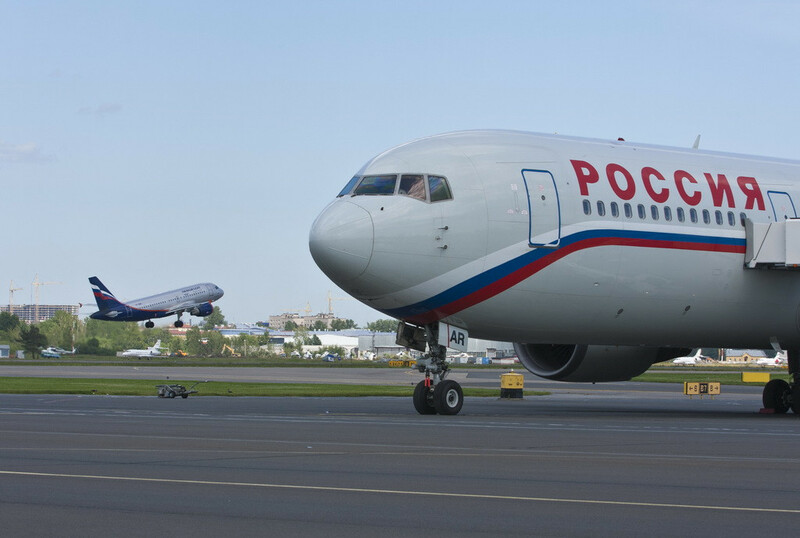 Attention: till December, 4, 2013 there had been two terminals in operation, Pulkovo-1 and Pulkovo-2. 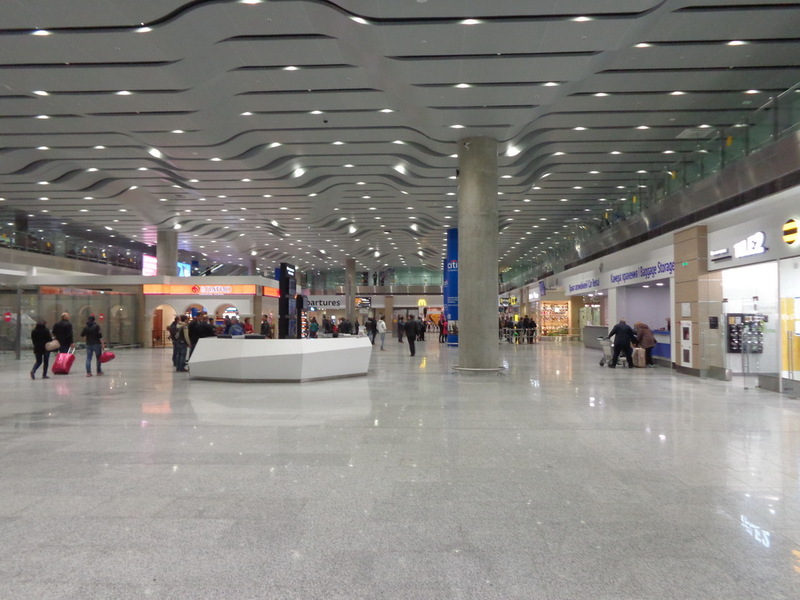 The former Pulkovo-1 is now a part of the new terminal, Pulkovo-2 is closed. Many guides unfortunately contain information on Pulkovo Terminals 1 and 2, as if they are still in operation though it’s out of time. Arrivals / departures timetable is on the front page of the Pulkovo’s website http://www.pulkovoairport.ru/en/. Arrivals are on the ground floor with two exits for passenger. The left-sided exit is for passengers of domestic routes (including ex-Soviet countries, members of CIS, i. e. Ukraine, Belarus etc. ), the right-sided one for international lines. Note that bus №39 and commercial minibus (marshrutka) K-39 deliver you from the city to the doors of the second floor (departures). For information contact two dedicated desks on the ground floor, opposite the exits. Eateries: McDonalds (6am – 02am), Il Patio (Italian restaurant, 24h), both on the ground floor. Coffee shops: Starbucks (24h, ground floor), Puro Gusto (24h, first floor). Shops: Stop Express, Hudson, Good news (in Russian Хорошие новости), where you can purchase newspapers, magazines, souvenirs, soft drinks. Pharmacy: two outlets of the Health people (in Russian it reads Здоровые люди) chain (on the ground and second floor). Banks: VTB24 (ground floor), cash machines throughout the terminal (Sberbank, Raiffeisen, bank St. Petersburg). As well: car rental, flowers, baggage storage, Russian Orthodox chapel, mother and child room, lost and found (in the right side of the terminal, ground floor). Hotel at the airport: Park Inn by Radisson Pulkovo Airport St. Petersburg. There is a capsule hotel named Aerospace and opened in December 2018. It’s located in the second floor near the Puro Gusto cafe. There are 13 capsules with TV, Wi Fi, mirror, king-size bed and shared bath facilities. There are seven hotels near the airport. Baggage wrapping costs 500 roubles, available at the ground and second floor. Pulkovo is a totally non-smoking area. Smoking area is located 15 meters away from the doors of the ground floor, a special sign will help you find the spot, just near the stop of transport. An access to a broadband wireless Internet connection is provided for free, but doesn’t work well. Where to Recharge Your Mobile / iPad / Notebook. It’s a big problem to find in Pulkovo a free socket to charge your gadget. On the first floor there are two stands with four sockets each. As well there is a coffee shop of Puro Gusto where some seats are located near sockets. After the passenger control you can also find a few stands in the waiting rooms.